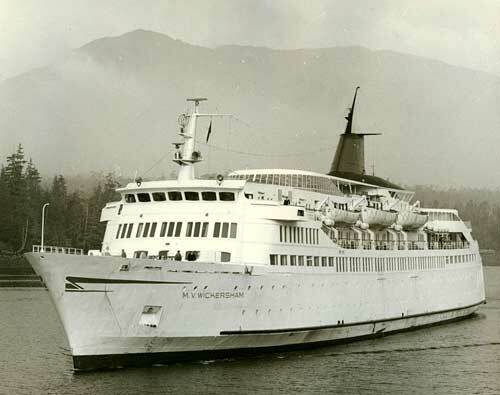 When the first Alaska state ferry sailed northbound through the Inside Passage of Alaska on its maiden voyage in January of 1963, there was rejoicing along the entire route from Ketchikan to Haines at the head of Lynn Canal! At last! Cars and even trucks and vans could now travel to and from isolated island-bound towns all along the 450-mile length of Southeastern Alaska's Panhandle. At either end they could roll off the ferry's ramp onto terra firma, connected to road systems north or south! The roadless towns of the famed Inside Passage finally had a "highway" from Prince Rupert B.C. to Haines, Alaska - even if it happened to be paved with salt water and used marine charts instead of road maps. 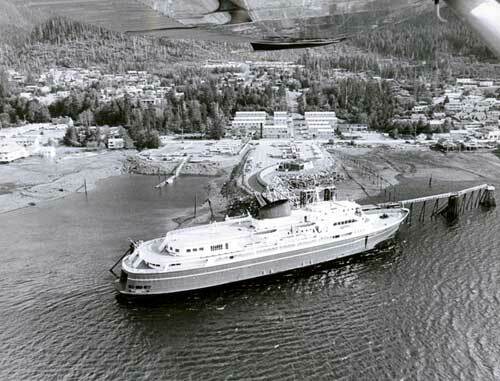 For forty-one years state ferries have plied the waters of the Inside Passage, adding additional vessels and routes as the system grows. Today the trim blue and white vessels with the painted eight-stars-of gold of Alaska's flag shining on their smokestacks sail along additional routes between Whittier and Valdez, to Kodiak, between otherwise isolated Native villages, and along the Aleutian's chain of even more remote islands. The state ferries deliver passengers, freight, news, gossip and good cheer. The ferry system is the state's lifeline along the routes of towns without road connection to the outside world. Curiously, on Alaska's vast mainland expanse that is home to the state's largest cities and the bulk of its population today, many if not most residents have only a vague notion of the existence of their state's ferries, their routes and their significance! That may be partly because almost two-thirds of today's 643,786 big-city-Alaska residents weren't yet born, or lived elsewhere during those earlier years when courageous Alaskans fought for statehood and an improved quality of life. And with the focus of the news media, it's not surprising that the ferries are often forgotten in light of the armada of high-profile and photogenic luxury cruise ships that now sail the Inside Passage, carrying visitors to one of the world's favorite tourist destinations. The state's present year-round, workhorse ferries seem small and insignificant compared to the behemoth, foreign-bottomed hulls that ply Alaska's inside waters from May through September each year. Back in the early days and generations of Southeast Alaska, a "car ferry system" was the dream and goal of roadless towns all along Alaska's waterways! And no Southeastern town, including Ketchikan - to become the first stop northbound on any future ferry route - was an exception. In those days, shipping the exciting and newly invented horseless carriages on freighters was slow and costly. Autos had to be secured on deck and deck space was limited. But ever since the first of Ford's amazing Tin Lizzies was delivered and rumbled off over the wooden streets, Ketchikan fell in love with the automobile! Every man and boy wanted to drive one of those daring machines over roads to the horizon and beyond! But they were confined to the plank streets of the city and the impassable muddy tracks of trails beyond. There's a story that when one of early Ketchikan's leading citizens couldn't get his sputtering and stalling Ford up the steep street to his home, he'd back it uphill in roaring reverse gear to the cheers of onlookers and the children running alongside it. Ketchikan was so enamored of the automobile that in the 1920s the city fathers actually considered blasting the boulders out of the impossibly steep Edmonds Street and paving it as a thoroughfare! And it may be myth, but it was also said that J.R. Heckman had a fear of backing his car out of his garage, so he installed a turntable so he could push the car around and drive out head first! But even as Alaskans hoped for "car ferries" to allow them to indulge their travel dreams beyond their own cities, they also realized what a boon car ferry travel could mean to their economy. A photo of a parade entry in Ketchikan's 1917 Fourth of July parade shows the more serious side of the community's wish for a ferry system. 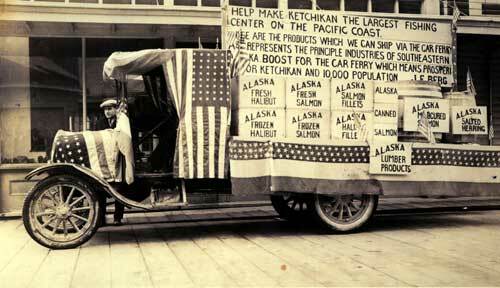 A Cordell Transfer truck was decorated with patriotic flags, bunting and a sign identifying it as "Car Ferry #1" It also carried a canopy of posters boosting the city's fishery products from herring to salmon to halibut, canned, fresh, frozen and mild cured. Another poster reads: "Help Make Ketchikan the Largest Fishing Center of the Pacific Coast." The signs also say that Ketchikan - which boasted about 2,000 residents at that time - was shooting for a population of 10,000! Southeastern's Panhandle was of major importance to Alaska in those earlier days of Alaska's history. Unlike today, its then-prosperous fishing and canning industry, the Juneau capital and its comparatively large towns were "the [economic] tail that wagged the dog" of mainland Alaska. The once-largest city of Nome had shrunk to village size. Fairbanks was a small, dusty town dependent on the fluctuations of the capricious gold market; and the little brand-new tent-city of Anchorage hoped for nothing beyond the Alaska Railroad construction work. At that time the "big" towns of Southeastern - and the especially its Outside canned salmon industry - largely controlled Alaska. It soon became apparent that Southeastern's wished-for car ferry system would never become reality as long as Alaska was a territory. The territorial laws allowed no chance to float bonds for development of a ferry system or other economic projects. Statehood - someday - for Seward's Ice Box was the only answer to Alaska's growth and survival! There was a brief campaign to attain Statehood as early as 1916 and again in 1925, a movement that even its advocates knew wouldn't go anywhere. The federal government was loathe to spend funds on the remote and "worthless" territory. And in the years that Alaska was a territory (1912-1958), the President of the United State appointed the territory's governor, the secretary of Alaska (lieutenant governor), judges, marshals and district attorneys. But Alaskans could not vote for the President who made all these choices and appointments! By the end of World War II, for various reasons, the pressure for Statehood began to be embraced by larger and larger numbers of Alaskans. It was also at war's end that both the military-built wartime Alaska Highway and the new Haines Cutoff were opened to travel. Military-built airstrips across the territory began to see increased air traffic. A wartime population boom continued its growth with the new Alcan highway accessibility. But down in roadless Southeastern Alaska, steamships were losing business. The once dependable passenger and freight lines were suffering from all the overland and air competition. By 1952, Alaska Steamship Co., the last American passenger service through Alaska, dropped its passenger schedules. In 1954 the last Alaska Steam freighter waved good-bye to Southeastern. So there it was, and something had to be done! Then came an organized and concerted battle for Statehood! In cafes and meeting rooms, in the halls of the territorial Legislature, in parlors, garages and barbershops, the talk was of Statehood. There were a number of varying reasons for wanting Statehood from town to town and region to region: Among them were abolishment of fish traps, building a ferry system, new and better roads, representation to match taxation, and a voice in Alaska's destiny. In spite of those who liked things just the way they were, during the 1950s the move for Statehood was on in earnest! All the necessary paperwork was pulled together: A state Constitution was drafted, Alaskans voted their preference to shed territorial status, and in the summer of 1958 the word came: The Congress of the United States had voted Alaska "in"! Alaska would become the first new state since Arizona joined the Union in 1912. Seward's Folly would officially become the 49th State as soon as the President signed the bill. In the wee hours of the bitterly cold early morning of Jan. 3, 1959, news flashed across Alaska that Pres. Dwight D. Eisenhower had signed the Statehood bill! Church bells rang in the frozen air, and as soon as businesses opened, they closed again - to celebrate! And celebrate Alaska did! Then came the initial session of the ready-to-go first Alaska State Legislature in the spring of 1959. Among other things, fish traps were immediately abolished. The Nenana Ice Classic was okayed to continue even if it is a sort of gambling game. And Alaskans working together spearheaded the push for a state department of public works to acquire ferries and ferry land-facilities. In the second session the following year, 1960, they spearheaded a proposal to provide the necessary funding for the ferry service. Then work got under way in earnest. 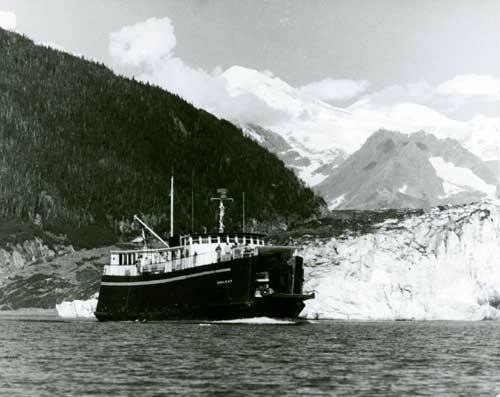 The first three ships, the Malaspina, Matanuska and Taku, were all named after Alaska glaciers, a tradition begun by Alaska's first Governor, Bill Egan. All three ships were under construction down south, each to carry up to 500 passengers, 105 vehicles and provide 44 staterooms; with reclining chairs in the fore and aft lounges to allow for snoozing on the shorter runs between towns. Work was begun for terminal facilities at each of the mainline ports of Haines, Skagway, Juneau, Sitka, Petersburg, Wrangell, Ketchikan and Prince Rupert, B.C. ­ "the little Canadian town that the Alaska ferries turned into a city." Rupert connects to Canada's Highway 16, a twisting route that the Canadian government improved and straightened in anticipation of the streams of expected future travelers. And they came! Like everything else, growth and eventually changes came to the Alaska Marine Highway System over the years. Mainline service was extended to Seattle and switched later to Bellingham. The Malaspina and Matanuska were "stretched" - lengthened by adding additional footage to their midsections. A larger ferry was added to the run. Smaller ferries were built for service between the smaller towns of the Panhandle -Metlakatla, Hollis on Prince of Wales Island, Kake, Hoonah, Angoon, Pelican and Tenakee Springs. A seagoing ferry was designed for the Kodiak and Aleutian run. 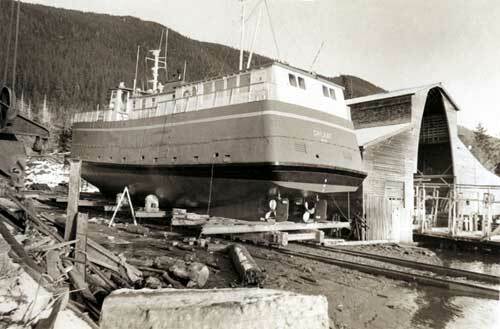 A dayboat ferry without staterooms was built to run between Whittier and Valdez. The Alaska State Marine Highway system continues to evolve. Smaller, faster ferries are being considered for more efficient short-hop service between towns. The ferry service is an expensive part of the state's budget. Those paying ferry passengers are actually guests of the State of Alaska, because only 60 percent of the revenue pays the cost of operation; a state appropriation pays the rest. And in spite of its budget size, the high marine highway system is still the most efficient of state services because of the high percent of revenue it generates. The ferries are dear to Southeastern Alaskans, and with good reason! But like comedian Rodney Dangerfield, they very often "they don't get no appreciation!"